If you have only one day for exploring Prague, then concentrate on the Castle District and the Lesser Town and end your walk in the heart of the Old Town. 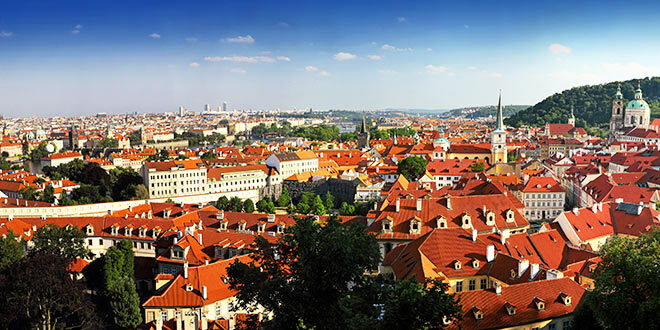 Once you get to the Prague Castle Complex, visit the Gothic St Vitus Cathedral and St George’s Basilica, and pass the small picturesque houses in Golden Lane. Then descend into the Lesser Town where you’ll find ancient burgher houses and the Baroque copper-domed St Nicolas Church. 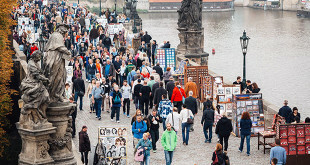 Making your way across Charles Bridge can take as little or as much time as you like; if you enjoy souvenir stands, performers, artists, musicians, or just beautiful city views, you may like to linger a while. If you want to feel even more the romantic atmosphere of the city you might wish to jump on the Venice Boat Cruise. During this short boat cruise (approx. 40 min) you will have a chance to see Prague’s architectural gems from the Vlatava river. The boat departure pier is just under Charles Bridge, accessible from Certovka, Kampa Island. Once across the bridge, walk along the riverside and have a break at the famous Café Slavia, on Smetanovo quay, where you can have a coffee while enjoying the view over the river and up to the castle on the other side. 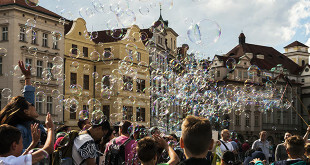 After the rest, continue walking to the Old Town Square to see the Astronomical Clock and watch ‘The Walk of the Apostles’ performing on the hour. From there continue your walk towards Celetna Steet where you can see quite a few architecturally and historically important houses, such as at the Three Kings, the White Lion, the Black Sun and the Black Madonna. The most interesting one, which is worth a visit, is the House of the Black Madonna, which dates from 1912 and houses a branch of the Czech Museum of Fine Arts with a permanent exhibition on Czech Cubism. Celetna street will eventually take you to the Powder Tower. Next to the Tower is the Municipal House. It is Prague’s most prominent Art Nouveau building, built between 1906 and 1912. It is a popular stop for visitors drawn in by the Art Nouveau gold trimmings, stained glass, sculpture, and the regular exhibitions and concerts. Walk to the Old Town Square, view the ‘must see’ Astronomical Clock and visit the beautiful Gothic Church of Our Lady Before Tyn or the baroque Church of St Nicholas. 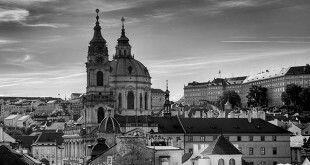 From there, head to the Charles Bridge and take some beautiful photos. Next, climb up to the imposing Prague Castle, where St Vitus Cathedral, the Golden Lane and the Royal Garden await. If you are tired of walking, you might take a tram up the hill and walk to the castle from the other side. When you get hungry, make your way back to Malostranske square and have a traditional Czech meal at one of the numerous pubs and restaurants. The second day is good for ‘laid back’ exploring or a leisurely walk along the river. From the Old Town Sq. walk to the Josefov, visit the Jewish museum, have a coffee at Slavia Café or at the Imperial Café. In the afternoon do some shopping around Wenceslas Square. 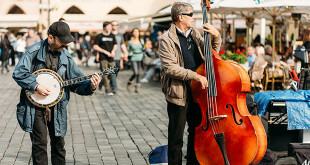 In the evening you could have a few pints of world famous Czech beer at the U Pinkasu pub, or if you like classical music you might attend a concert at the Rudolfinum. For the first two days follow our two-day itinerary. And on your last day: in the morning either you can do a half-day trip to the medieval Karlstejn castle, visit the nearby medieval town of Kutna Hora, visit some of the museums and galleries or go shopping etc. In the afternoon, have lunch in one of the Lesser Town restaurants, then take the funicular railway up to the Petrin Hill. It is an excellent place for a relaxing walk in the peaceful gardens, with great views over the city – and for even more spectacular views don’t forget to visit Petrin Observation Tower. If you are energetic enough, continue walking from the Petrin Hill to the Pohorelec (Hradcany) and visit Strahov Monastery. From there take a scenic tram no.22 back to the city. Cover the sights mentioned in the three-day itinerary, then add in visits to museums, galleries, and Stromovka Park including the Exhibition Grounds. If you are energetic, do the walking tour from Letná to Troja Château and get the boat back into town (or vice versa). Also you will have time for a day trip to Kutná Hora or to do the Pilsner Brewery Tour. One week will give you more time for soaking up the city atmosphere, and you won’t get bored.